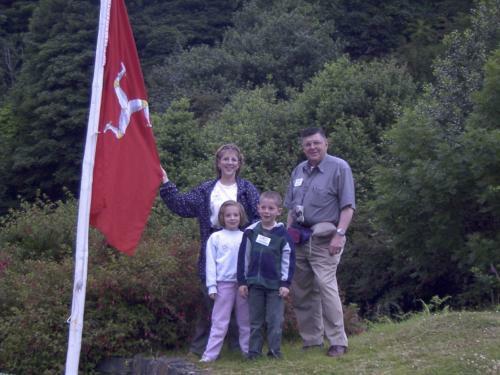 Helen, her twins, and my husband John on the Isle of Man, ancestral home of the Hodgson family. Our elder daughter, Helen, died from the injuries she received in a car crash in 2007. Since then, my husband and I have honored her memory in different ways. At the suggestion of the co-directors of music at our church, we donated funds for a commissioned song in Helen’s memory. Composer Elizabeth Alexander set words by Rabbi Sylvan Kamens and Rabbi Jack Reminer to music. The premier of “We Remember Them,” was held at our church and her stunning music made us cry. We’ve donated to the public library in memory of Helen. She checked out audio books and listened to them to and from work. After she became a composite engineer, Helen couldn’t find a job in Rochester, Minnesota, so she accepted a position at a factory in the Twin Cities and supervised three production lines. Every morning, Helen got up at four a.m. and drove an hour and a half to work, and an hour and a half home. Listening to audio books helped keep her awake and alert on the road. Ever since Helen died we’ve contributed to the Channel One Regional Food Bank, which serves Southeastern Minnesota. If my memory is correct, the food bank serves about 10,000 clients a year. Giving to the food bank was satisfying, yet we wondered if we should try something different on the 11th anniversary of Helen’s death. Several ideas were considered. One was to donate books to the library that represented Helen’s interests. Narrowing down the book choices would take some time, however, and involve the selection of her key interests. Helen loved to bake pies. Should we donate pie cookbooks to the library? Would donating books about composite engineering help many people? Probably not. Some of my friends planted trees in memory of their loved ones. Others created photo displays. The idea of planting a tree was appealing, but to do it, we would have to submit a plan to the Home Owners Association. Getting its approval could take months. Since we didn’t have room in our townhome for a large photo display, this brought us back to the food bank idea. According to the Channel One Regional Food Bank website, one in ten residents of Southeastern Minnesota is food insecure. Though we had been donating to the food bank for years, we didn’t realize we had created a tradition. Helen enjoyed cooking and donating to Channel One is a fitting memorial to her. It’s the best memorial. Feeding the hungry would have brought Helen immense joy. Harriet Hodgson has been an independent journalist for 35+ years. She is a member of the Association of Health Care Journalists, Association for Death Education and Counseling, Minnesota Coalition for Death Education and Support, and World Speakers Association. Hodgson is a Forum Moderator/Writer for www.opentohope.com and author of eight grief resources.